FOUNTAIN INN, S.C. (May 8, 2017) – AVX Corporation, a leading manufacturer and supplier of passive components and interconnect solutions, has received a prestigious 2016 Rockwell Collins Platinum Premier Award, which honors top-performing suppliers for having maintained the highest levels of quality, delivery, and business alignment over the full course of the year, and is the highest recognition a company can achieve through Rockwell Collins’ Trusted Supplier Program. Introduced in 2013, Rockwell Collins’ Trusted Supplier Program fosters supplier collaboration to improve efficiencies and drive performance, and provides a formal framework to measure suppliers’ achievements and celebrate collective success. The program couples quantitative performance measures, including delivery and quality, with qualitative assessments of total cost of ownership, technology, and customer support to recognize supplier contributions to the company’s overall strategic success. Suppliers that earn a Platinum Premier Award have achieved zero direct defective parts per million (DPPM) and fewer than 1,000 DPPM in purchased assemblies, 99.9 – 100% on-time delivery, and the highest levels of performance in all three Business Alignment categories: Ownership, Technology, and Customer Support. 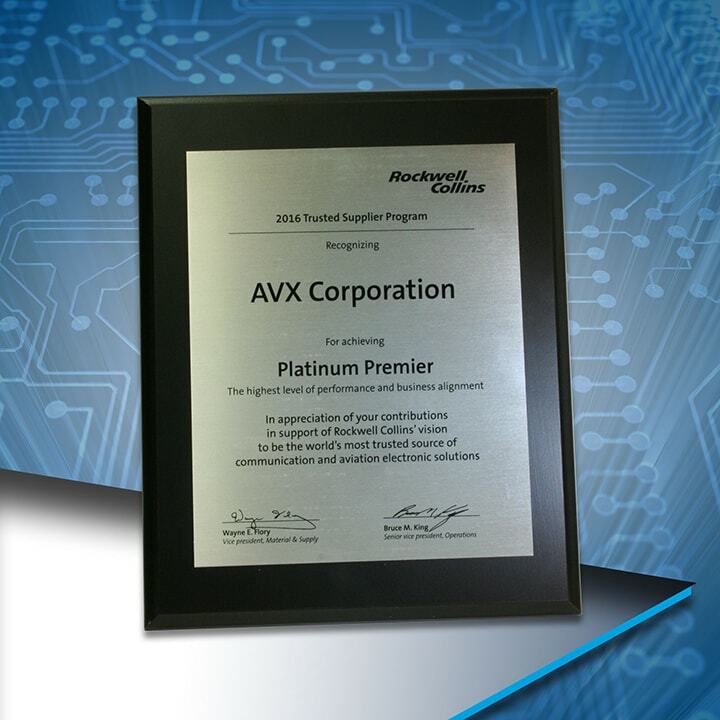 “We are honored to have earned an apex performance award from our longtime supply chain partner, Rockwell Collins, and look forward to continuing to exceed expectations as we collaborate to deliver the highest-quality communications and avionics electronics with the utmost safety and reliability the industry has to offer,” said Pete Venuto, senior vice president of sales, AVX. For more information about Rockwell Collins’ Trusted Supplier Program, please visit https://rockwellcollins.com/~/media/BCD28748BC814CCEAA9E2E68935508AB.pdf. For more information about AVX, please visit www.avx.com, call 864-967-2150, or write to One AVX Boulevard, Fountain Inn, S.C. 29644. Rockwell Collins (NYSE: COL) is a leader in aviation and high-integrity solutions for commercial and military customers around the world. Every day we help pilots safely and reliably navigate to the far corners of the earth, keep warfighters aware and informed in battle, deliver millions of messages for airlines and airports, and help passengers stay connected and comfortable throughout their journey. As experts in flight deck avionics, cabin electronics, cabin interiors, information management, mission communications, and simulation and training, we offer a comprehensive portfolio of products and services that can transform our customers’ futures. To find out more, please visit www.rockwellcollins.com.